Take and ace the GRE. I took the GRE. I didn't quite ace it, but I did well enough. Run 100 miles. I only ran 77 miles. I was in a bit of a slump, but after this weekend's milestones I can safely say the slump is over! Read more. I'm making good progress through Inside of a Dog and will finish it soon. I definitely won't make it to 25 books for the year, but I'll try again in 2011. No restaurants, lattes or eating food that was not prepared in my own home.A total and utter failure. I made it about three days. We are, however, getting better about eating out. I realized it's cheaper to buy a box of veggie burgers when we're lazy or crunched for time instead of going out for sushi yet again. Just because we're eating at home doesn't mean I have to cook up a huge production. Easy meals are just as good. Not too shabby. This month will be pretty light and focused on tying up loose ends before the start of TWENTY ELEVEN and the smorgasboard of resolutions and goals that will accompany the New Year. I can't wait! But first: goals for December. Submit MFA applications for real. I don't really have a choice, considering there are actual deadlines and all. Return all borrowed items. I borrow things from friends and I take good care of them, but I don't always return them in a timely fashion. I have a lot of things clogging up my feng shui that aren't actually mine! Time to give it all back. Build a new desk for the office and reorganize the room. This should also be easy, as Nathan has already drawn up plans AND given away our old desk. That's right - we are currently desk-less. Clearly, this is a hardship that must be rectified ASAP. Mail out and/or deliver Christmas presents in a timely fashion. Timely = before January. Up my running to four times a week. Yoga at least twice a week. The marathon is in less than two months and training is getting SERIOUS. Enjoy the holiday season. We decorated a Christmas bush (photos coming soon!). I bought wrapping paper. I'm going to bake gingerbread, attend holiday parties and listen to Christmas music, and I'm going to enjoy it! (More on this later, but suffice to say I'm ready to shed my Scrooge ways.). I'm fairly certain I can accomplish all of these things, and that I might even had a good time doing so! 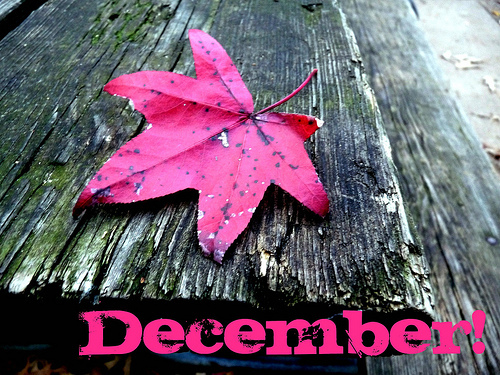 How is your December shaping up? Are you cramming all your 2010 resolutions into the next four weeks, or are you planning to relax and then give it your all come January? I'm doing a little of both, which is just the way I like it.